It's innocent mindless entertainment, but fun nonetheless. Once again we return to the adventures of the Blitz team with this month's release of the second volume of the Zoids saga. Perhaps it's growing on me, but I think I enjoyed this volume a bit more than the first one. I do not dislike this series - in fact, I find it very entertaining. It doesn't pretend to be anything it isn't, even if it is a blunt way to market some really cool toys. If anyone wants to deny that claim, please note the "bonus feature" that is nothing more than a TV ad for the toy line. As simple as it is however, it truly is quite a bit of fun, and with a lower than average MSRP (due to the exclusion of a Japanese language track, no doubt), it's not likely to eat up a big chunk of your savings (that's what the toys are for, silly). For those of you who haven't been introduced to the lucrative world of Zoids yet, allow me to explain. In the future, a race of sentient mechanical beings (similar in appearance to metallic animals) known as Zoids that have been raised (or created?) to be piloted by humans and pitted against each other in regulated battles. These battles, while highly destructive to the area they occur within, tend to be rather safe, as no pilots have died in any of the shows...yet. With the prize money earned from a successful bout, the victors dash to the nearest arms dealer and purchase new weapons and armor for their precious Zoids (not unlike those of you with Zoids model kits...you know who you are!). The heroes in this story are all members of the Blitz team, financed by Doc, the father of the excitable Lina and her more reserved younger brother, Jamie. Also on board are Bit Cloud, the series' main protagonist, and the pilot of Liger Zero, a mysterious and powerful Zoid that only Bit has the natural talent to control. (Incidentally, I've only recently discovered that Ligers DO in fact exist, though they do not occur in nature. In captivity, they're the result of breeding a lion with a tiger. They can be up to twice the size of either of their parents, but just as agile. Scary, isn't it?) With Bit's help, the Blitz team has performed exceptionally well lately and is quickly moving up in the Zoid battle ranks. The four episodes on this disc introduce a few new characters in addition to involving some old favorites, such as Harry Champ, the annoying guy who's chasing after Lina, frequently reminding us he's "a man destined to be king." The fifth episode is the first time we get to see some of the new accessories for the Liger Zero, in particular the Jager speed and maneuverability upgrade. In the midst of battle, Bit can now take the Liger back to the Blitz team's mobile base and automatically attach new components onto the Zoid. It's a neat scene...until you realize it's going to be used as stock footage from that point on for the foreseeable future. Another encounter with the Backdraft organization occurs as well, when they forcefully pit the Elephander Zoid against Bit's team. This show will satisfy its fans, and most likely entertain even people who haven't seen it before. It tends to be rather episodic, but it's very well animated, with bright colors and sharp character designs. 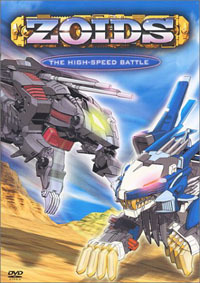 It relies heavily upon cel-shaded computer graphics to blend the Zoids into the rest of the show. The effect works very well, enhancing the series rather than bogging it down as too gimmicky. It also boasts an above-average soundtrack and well-used sound effects to heighten the experience. If it was a bit deeper or began to progress the plot beyond fighting and buying new Zoid parts, it would not only be a fun show to watch, but a good show, too. Of course, the inclusion of the original Japanese language track would have scored it a considerable amount of points as well. This is a rather good dub, but I've always preferred the Japanese language to English. Regardless of its flaws, Zoids is lighthearted and funny, and it provides a good amount of action for those of us who need to see giant mechs pounding on each other from time to time. If you're a fan of mechs or just enjoy seeing things blow up, this might just be the show for you.